Many people—millions, in fact!—live in a state of constant stress, accepting it as an unfortunate consequence of modern, fast-paced life. While it’s perfectly natural to experience stress from time to time—the stress response evolved from our natural “fight or flight” response—it shouldn’t be a daily visitor. Frequent stress leads to unwanted health consequences, including migraines and sleep disorders. Far too often, we rely on unhealthy behaviors, such as smoking or frequent alcohol use, to manage our stress. This can perpetuate a negative cycle that’s difficult to break. Knowing this, it is not surprising that stress is a contributing factor in the six leading causes of death in America, including heart disease, cancer, and lung disease. If you’re committed to leading a life of less stress, we’ve outlined simple steps that you can begin today. We aren’t promising total bliss, but learning to manage your stress effectively can literally add years to your life! Chronic stress affects our physical health, our mental health, and ultimately, our mortality. Emotional stress is especially damaging. While stress is pervasive, there are ways to mitigate its effects. Besides practicing mindfulness or deep breathing regularly, eating a healthy diet and getting good exercise, several herbal supplements and vitamins have been shown to help alleviate stress and its symptoms. While stress may be more common these days, it has affected people for thousands of years. In ancient times, people used herbal therapies celebrated in traditional Chinese medicine and Ayurveda to help manage stress. Consider yourself a skeptic? Rest assured that recent clinical studies are lending credibility to long-held beliefs regarding the impact of herbal medicines. Ashwagandha has a storied history in traditional Ayurvedic medicine. The entire plant, from roots to seeds, has beneficial properties, especially when it comes to stress reduction. The benefits of Ashwagandha are wide ranging, but it’s a superstar when it comes to getting people to feel less stressed. One particularly interesting study from 2017 showed a 44% reduction in stress levels after taking Ashwagandha, as opposed to just a 5.5% decrease in the group taking a placebo. A randomized 2012 clinical trial showed similarly impressive levels of stress reduction after just 60 days. Rhodiola is a plant native to the arctic regions of Asia and Europe which has a rich history of medical usage dating all the way back to 77 C.E. This plant, also known as Golden Root, is used for for energy enhancement, to improve mood, and most critically, to reduce stress. In a 2009, double-blind study, Rhodiola was shown to reduce stress, and increase alertness in doctors on night shifts. Working the night shift is notoriously stressful, so anything that can help those folks should be able to help others, as well. The most extensively studied property of Rhodiola is it’s ability to help people deal with fatigue. Since exhaustion often contributes to stress, anything that reduces fatigue can help in the battle against stress. It might sound like something from the HBO show Game of Thrones, but valerian is a perennial plant native to Europe. It has been used to help with nervousness, anxiety, and sleep disturbances since the second century A.D. There is encouraging evidence that supplementing with valerian root can reduce stress. Valerian root is well-known for supporting quality sleep.. This is largely due to its calming, sedative effect. The best part? Because lack of sleep is a trigger for stress, one of the best things you can do to improve your stress levels is get a good night's rest. If valerian root helps, it can be a potent, low side effect tool in your de-stressing arsenal. __Bacopa monnieri__ is a perennial herb that has proven stress-reducing benefits. It’s been used as part of Indian Ayurvedic medicine for centuries to enhance learning, boost memory, sharpen focus, lower stress, and improve mood. In a 2011 study using animals as subjects, Bacopa was actually shown to increase the length of the brain's nerves, which may result in speeding up communication between these nerves. Modern research has also focused on Bacopa’s remarkable ability to relieve stress, which it achieves partly by lowering cortisol levels in the blood. Cortisol is the stimulating stress hormone, so lowering it has a powerful relaxation effect. Low energy and fatigue can contribute to irritability and stress levels. This is why the B vitamins, which are well-known for keeping energy levels high and improving cognitive performance, can have a positive effect. Clinical data suggests that supplementing with a vitamin B complex can help keep your energy high and stress low. Clinical trials have also shown that supplementing with a vitamin B complex can help reduce “personal strain,” and depressed feelings when in high stress situations. In essence, it supports a feeling of calm and stability. If you want to be more relaxed (and focused!) under strain and pressure, supplementing with a B complex could be a major help. Magnesium is a mineral that is essential for muscle and nerve function. Multiple studies have shown that magnesium is especially crucial for sleep, with supplementation helping in this regard. A 2012 study published by the National Institute of Health demonstrated that supplementing with magnesium improves sleep quality. As mentioned, sleeplessness and stress go hand-in-hand. We all know the struggle and frustration of tossing and turning in bed all night. If that is something you struggle with, magnesium is worth consideration. It is important to keep in mind that the first line of defense against stress are three key lifestyle factors: relaxation, diet and exercise. If you eat a balanced diet and have a consistent movement practice, you are less likely to develop stress and anxiety disorders. Furthermore, breathing practices can be helpful for stress relief. Meditation in particular has been shown to be calming and helpful in reducing the symptoms of stress and anxiety. If it is work or personal relationships that have you stressed, you may want to “unplug” for a bit. Consider a 24- or 48-hour break from electronics and social media. A 2011 study showed that detaching from work-related communication during non-work time was positively associated with employee recovery and health. A small ritual like putting your cell phone out of sight, or even turning it off can lend immediate relief! Another way to reduce stress is to consume green tea, due to it’s L-theanine content. L-theanine is an amino acid found in green tea leaves. Studies show that L-theanine is particularly adept at reducing both the psychological and physiological stress responses. There is an emerging body of science indicating the restorative power of natural settings and environments. This could mean immersing yourself in the outdoors with a day at the beach or a hike. Alternatively, you could introduce natural elements, like plants, into your office or home. Yet, even those who meditate, drink tea, exercise, and eat healthy are going to deal with stress. It’s a part of living a full and active life. That being the case, you will set yourself up for success if you strategically supplement with herbs and vitamins that are scientifically proven to reduce your anxiety and boost your energy. 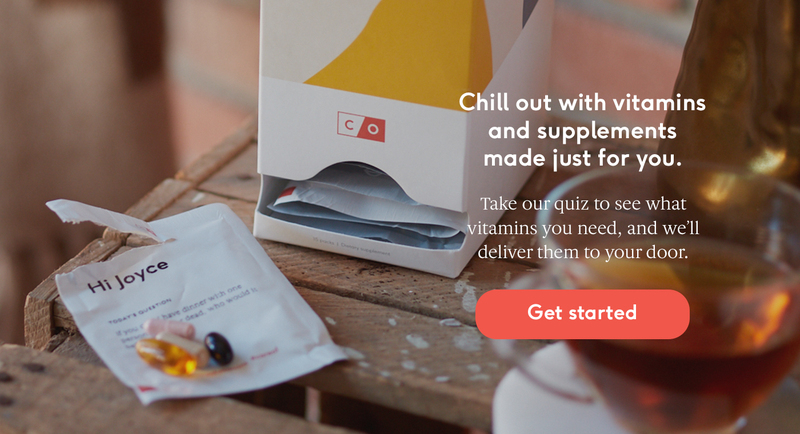 Consult with your healthcare provider, or take an online lifestyle assessment to receive personalized supplement advice tailored to your unique needs.